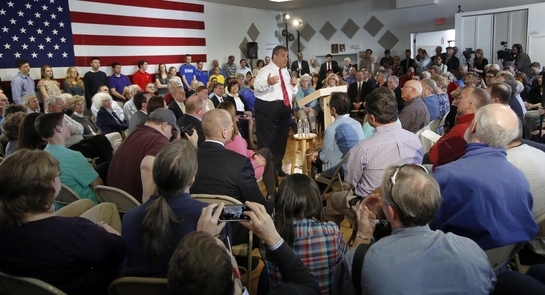 Chris Christie, on the campaign trail in New Hampshire, takes questions during a town hall meeting with voters. GOVERNOR CHRIS CHRISTIE of New Jersey had planned on six uninterrupted days campaigning in New Hampshire, hoping to build momentum in the last weeks before the first presidential primary on Feb. 9. Then came winter storm Jonas, which enveloped much of the East Coast in a historic blizzard, sent devastating flood waters into Jersey Shore towns, and left tens of thousands of New Jersey residents without power. Though Christie had said on Thursday he had no plans to return to his state, by Friday afternoon he had no choice. "I'm sorry New Hampshire, we've got snow coming in New Jersey so I gotta go home," he tweeted. "But, I'll be back." Thirty-six hours later, he was. At a town hall meeting at the VFW post in Portsmouth on Sunday, Christie didn't wait to be asked about his in-and-out response to the blizzard, for which he has been amply criticized. Instead he set about turning lemons to lemonade, pointing to the weather emergency as a vivid example of why voters should be looking for a president with gubernatorial experience. "The last 36 hours will show you something," Christie said even before taking the first question. "New Jersey had someone in charge who knew what they were doing." The weekend's massive blizzard was Christie's 17th snow emergency as governor — not including 2012's deadly Hurricane Sandy. "It's not that I was born with the innate ability to deal with snow emergencies and hurricanes. It's that I've done it." Donald Trump, the presumed Republican front-runner, treats his ignorance about the nuts and bolts of governance as a political virtue. In this strange political season, many voters, smoldering with anti-establishment, anti-elite resentment, seem to relish the idea of electing a chief executive whose résumé emits no whiff of relevant political experience. A Rasmussen poll released this week found that 30 percent of likely US voters would prefer to vote for a presidential candidate who has never held any public office. Among Republican voters, an astonishing 48 percent say they want a governmental neophyte in the Oval Office. Christie urged New Hampshire voters not to succumb to that temptation. "It matters what you've done before," he told his Portsmouth audience. "And it doesn't matter whether it's an impending storm or whether it's the scourge of radical Islamic jihadist terrorism." It was a point he kept returning to. Asked why he had rebuffed pleas to run for president in 2012, Christie answered that he had been governor for only 19 months, and didn't feel experienced or seasoned enough to be president of the United States. But in the four years since, he had learned an enormous amount — above all during Sandy, the worst natural disaster ever to strike his state. It forced him to make "multiple, multiple decisions" daily, and to take ownership of the consequences. "Without that experience I wouldn't be ready to be president." When a questioner asked Christie what he would seek in a running mate, he replied that he would choose someone "with executive experience, like me." That's what he had done in New Jersey, he said, and it explained why his first inclination wasn't to rush home before the blizzard hit: He was confident the state's operations were in capable hands. And the fact that he changed his mind and did return to New Jersey after all? Deftly, he spun that too as part of his brief for why New Hampshire's voters should prefer a governor. Legislators like Senator Marco Rubio avoid making decisions and get away with it, Christie said, referring to his Florida rival's many missed votes in Congress. But it would have been unthinkable for him, with a record snowstorm on the way, to refuse to return to leave New Hampshire to do his job. "We do not need to have more people sitting in the most responsible job in the world who like to be absolved of responsibility," Christie argued. "I want the responsibility. Bring it on. You won't always like what I do, but you will know that when there's a crisis I'll be there." It's a pitch few candidates can make as forcefully as Christie. But he's a long way from closing the deal with New Hampshire Republicans, and time is running out.